Lot 678. Caracalla. As Caesar, A.D. 196-198. AR denarius (15 mm, 3.52 g, 6 h). Rome, under Septimius Severus, A.D. 196-198. 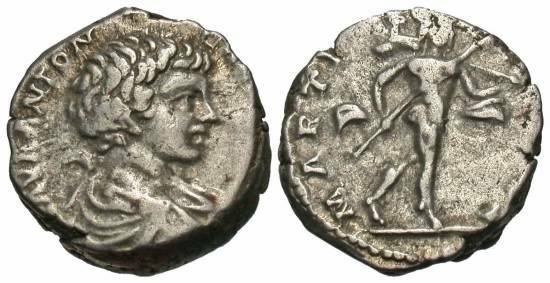 M AVR ANTON CAES PONTIF, bareheaded and draped head of Caracalla right / MARTI VLTORI, Mars advancing right, holding spear and trophy. RIC 11; BMC 202; RSC 154. Toned. Tight flan. Very fine.